While on CurlyNikki this morning, I read a very inspiration message that I wanted to share with y'all. 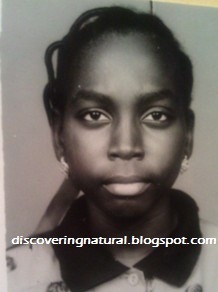 This post was written by Noni of ThreeNaturals. Click on the image below to read the article. 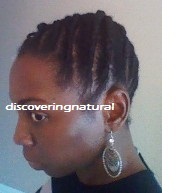 Styling my hair in cornrows help me protect my ends and also keeps me from having to do my hair everyday. 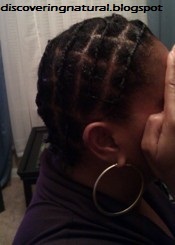 I usually keep my hair cornrowed for about two weeks. Here are my routines for morning and night. Twice a week, apply a little shea butter to the scalp. Apply Wild Growth Oil mixed with Jojoba oil and Orange oil onto scalp, massage scalp gently. Do this twice a week. Tie scarf over head for about 30 mins. Twice a week, bag hair using water and a mixture of Jojoba, coconut, and vitamin E oils. Tie scarf over head all night. This morning, while tending to my edges... 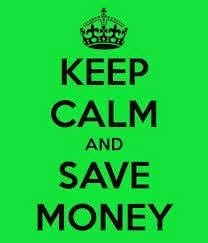 I do that way too much!... I noticed something interesting. I saw baby hair on my edges. Now, I know baby hairs usually lies flat, but this one had a funky curl to it. I was like... what in the World?!?. 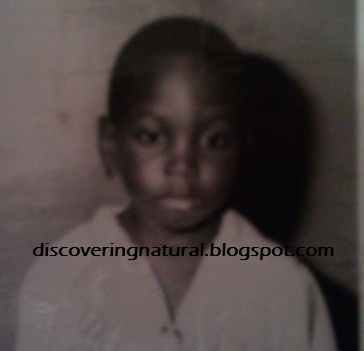 As you all know, I am currently in my 3rd month of transistioning from relaxed to natural. I can't remember how my natural hair was, so discovering these little curlies makes me sooooo excited! Hmm.. 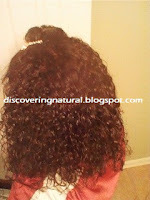 I wonder if my natural hair will look like this. Hopeful thinking! 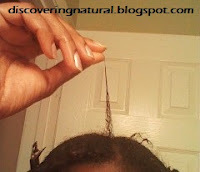 Another discovery about taming hair edges. While watching an old episode of The Weekend Show with KimmayTube on YouTube, I learnt different ways to prevent thining edges and also to smoothen rough edges. 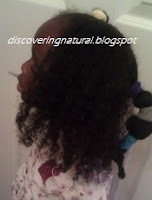 One that I do daily for myself and my girls is to use a soft brush to brush their edges (nape and temple). 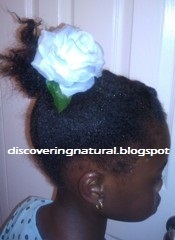 KimmayTube suggested wetting the hair with water and tying a silk scarf around the edges for 10 minutes or more. I have been doing this in the past, but also using the brush. I know for a fact that tying down the hair with a scarf does work to smoothen the rough edges. I will be trying this with the girls and myself from this day forth! First of all, what is Banding? 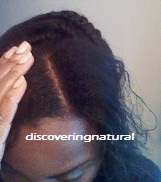 Banding is the process of stretching washed hair without the use of heat. 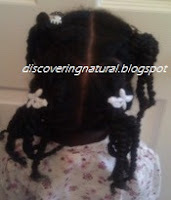 I wanted to try this system for my younger daughter because although she has mid-waist length stretched hair, she has lots of shrinkage giving her about shoulder length hair, when twisted. Trying branding would help her acheive the length that she has when her hair is damp and finger stretched. Scunci Effortless beauty cloth head ties was used for the banding process. I got this from Dollar General for $1 for a pack of 8 head ties. I ended up buying 3 packs (24 head ties). I did the monthly clarification with Garnier Fructis Triple Nutrition Fortifying Shampoo. I did a deep condition with 4 tbsps of Silk Elements Luxury Conditioner and 1.5 tbsp of Grapeseed oil. After DC, I detangled her hair and checked for any split ends. Luckily, she didn't have any.. YEAH!. By the time I was done doing this, I didn't even need to towel dry her hair. The next morning, I removed a section of hair. The hair had stretched some what, not as much as I would have like, but SO MUCH more than when I just hair dry or blow dry her hair. I try not do blow dry her hair frequently because I know that causes breakage. Another thing I like about this process is that she maintained her hair curl type (Type 4a) and texture. Her hair was styled into twists using Shea Moisture Organic Curl Enhancing Smoothie Coconut & Hibiscus and sealed with my shea butter mix. 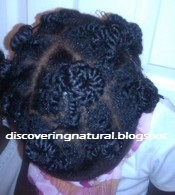 Her hair can be worn with the twists all down, or gathered together to protect the ends. 2. Add more head bands to create more stretch. 3. Section hair in more than 4 sections to reduce drying time. Her hair was still a little damp this morning. Yeah! TGIF! It's Friday! Bring on the weekend!! 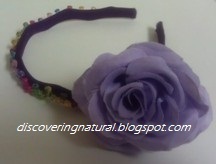 I love making hair accessories, such as headbands, hair clips, flower clips. I think the glue gun is the best invention EVER!.. okay, not really. LOL. My kids have a lot of beads that they use to make bracelets and necklaces. They are such girly girls and love to accessorize as much as their mom does. So, we decided to make some headbands with some of the beads they had. It so easy that even a 3 year old can do it. I PROMISE! Just 3 easy step! 2. Apply some glue to the headband. I prefer fabric-covered headbands, but plastic ones can be used. That's it....and VIOLA! You have a pretty headband that you can wear. You can go as playful or as classy as you want. I decided to style my daughter's hair differently for the weekend. 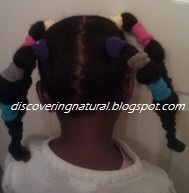 After having threaded hair for two weeks, I wanted to give her hair edges a break. I got this idea from PrettyDimples01 on YouTube. I just love YouTube.. I get so many ideas from there. 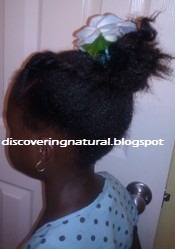 I wanted to clarify her hair to remove any product buildup. I clarify my hair and that of my girls once a month. To clarify her hair, I used Garnier Fructis Triple Nutrition Fortifying Shampoo. This product does contain Sodium Laureth Sulfate. I do not normally use sulfate shampoo regularly because this tends to dry out the hair. By for clarify the hair, it is essential. Washing her hair, in four sections, helped to reduce tangles. I applied the product to each of the sections and this shampoo also detangled any tangles (she didn't have any *YEAH*). I created a mixture of 3 tbsps of Silk Elements Luxury Conditioner and 1 tbsp of Grapeseed oil. Reason for using the grapeseed oil: It moisturizes the hair and scalp, making hair supple reducing brittleness, breakage and helping to protect the hair ends from splitting (1). I saturated each sectioned hair with this mixture, covered the hair with a plastic cap. After 30 minutes, I gave her a trim because while washing her hair, I noticed that I didn't get all the relaxed ends off from the last time I did a mini-big chop. This keeps the hair healthy. The products that I use for each of my daughters are different due to the fact that each of them have different hair types and textures. My older girl has more of a type 4c hair, whereas her sister is a mixture of 4a and 4b. 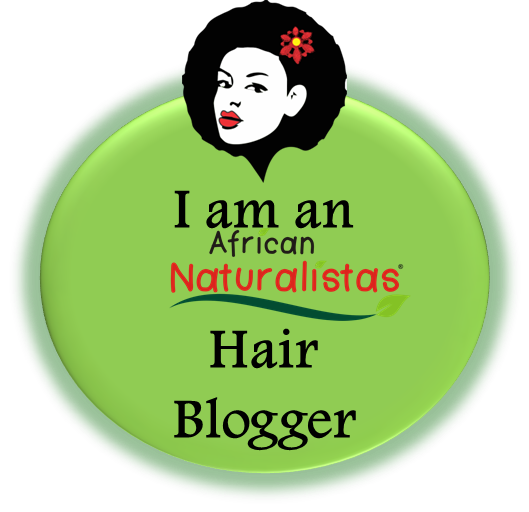 Click here for more info on Hair types and textures. I am so looking forward to finding out what my hair type is. Leave- in conditioning: 2 tbsps of Shea Moisture Deep Treatment Masque and 2 tsps of Coconut oil. I have used Shea Moisture Deep Treatment Masque in the past as a Deep conditioner, but it didn't really do anything for her hair. So, I thought I would use it as a leave-in. Now, I don't think I will be using it on my 4c girl again!! It left her soft hair feeling dry, even though her hair was damp. 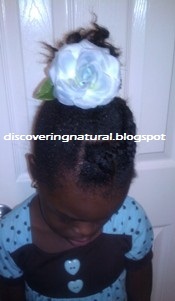 Her hair did not feel moisturized even with the addition of coconut oil, a great moisturizing essential oil. I wanted to wash off her hair, but decided not to put her through the process again. I probably will do a co-wash sometimes next week to just refresh her hair. Keep in mind, I have not combed her hair with a comb and it really suprised me how her hair was not tangled and very manageable. Using my fingers, I sectioned her hair and applied small amount of Shea Moisture Organic Curl Enhancing Smoothie Coconut & Hibiscus, I then two strands twist the hair and put a little bit of my shea butter mix to the ends to seal in the moisture. I love using shea butter as my sealer. 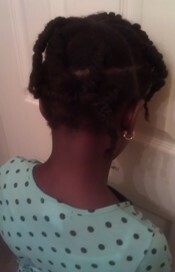 When done with twisting all her hair, took about an hour and a half with a short 10 mins break. 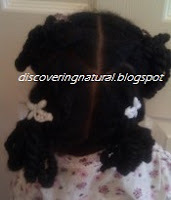 I started to Bantu Knot the twists, gathering about four twists at a time., using a bobby pin to hold the knots in place. I let her sit under a hooded dryer, because this helps reduce frizzness post-drying. Here is how I styled her hair for the day. 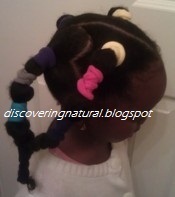 This style is very versatile and my daughter loved it. Yesterday, I blogged about the Damn salon and the Nwele style. I wasn't sure how I would like this style, and since I am currently in my 2 weeks protective style (cornrows with single braids), I decided to let my daughter try out this style. 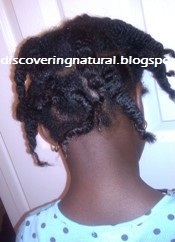 First of all, I did a "take down" of her 2 weeks old threaded hair style. 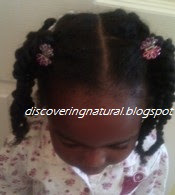 As some of you know, she has now been fully natural for 1 year 2 months. 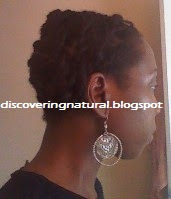 I chopped off all her relaxed hair last month, December. Although she lost length, I am glad that her hair looks more healthy. With proper maintenance, we will see some lengths soon. Anyways, sorry for the digression. Here is her style 2 weeks ago (left side) and what it looked like this morning, 2 weeks later. The roots have bulged out because of some growth and general wear over time. After taking out the thread, here is what it looks like. This is the style that was futured by the stylist from the Damn salon. Don't worry, I didn't let her go out like this. 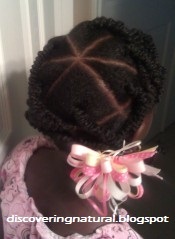 I decided to put her in a puff with some single braids tie-back in front. I did not comb out her hair. I NEVER comb dry hair because that can causes breakage. 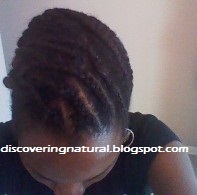 I used my water oil mixed spritz to smoothing her edges and finger combed the individual unthreaded sections. Then I accessorized it with her favorite flower headband. You can see how the puff has a curl to it. 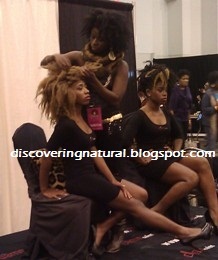 Last year, I attended my first Natural Hair show and saw the ladies of The Damn Salon, a Douglasville, Georgia based natural hair salon, showcasing their work. I'm not a big fan of big hair but one of my friends was quite excited about their work. She said, "Isn't this what you do to your daughter's hair?". 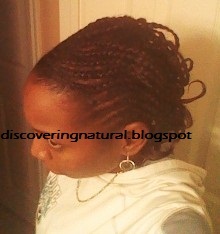 What she was refering to was the process of African Threading to stretch out the hair. To me, this was nothing new. As a child, I loved getting my hair threaded because that meant my hair will grow, and the "take down" process was very quick unlike when I get my hair cornrowed. My daughter also loves her hair getting threaded because of these reasons. Like mother, like daughter. The only thing different that the stylist from the salon was doing to the models was threading the hair, and then removing the thread....What?? now WAIT a minute!! The whole beauty of threading is to have the thread on the hair and recreate different styles by using unquie placement of the threaded hair. Now, the whole removal of the threads and wearing it in public looks like craze-man to me! Anyways... I wanted to see if people would really wear styles like this out.. and they do! Wow! 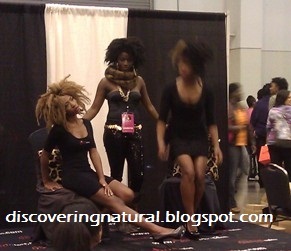 Here are some pictures from the Natural Show with stylist Mushiya of the Damn Salon and the models with stretched hair after being threaded (known also as the Nwele process). Yesterday, on the Dr. Oz show, he mentioned that the body needs at least 7 and a half hours of sleep to do its repair work. That got me into thinking about my sleep habits. I'm not a good sleeper. If I get 5 hours of sleep, I feel that is great. Although, I would love to get more than that, sometimes life comes in the way, and it doesn't happen. I decided to do some research as to the correlation between Sleep and Hair Health. Would getting more sleep improve my overall hair health? Since lack of sleep that cause stress, and we all know how stress that affect our health, and since our hair is attached to our body, indirectly, it will surely affect our hair. So, my plan *fingers crossed* is to get at least 7 hours of sleep. Last night, I did 8 hours of sleep... OH BOY!... I woke up feeling tired and quite sloggish. I couldn't even complete my normal 1 hr run this morning. I guess 8 hours is too much for me. 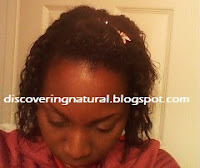 I believe the main thing I want to focus on is not really Hair Growth, but overall good hair health. What do you think? Has sleep impacted your hair health? I decided to do my cornrows to protect my hair for the next two weeks. I was watching NapturallyCurly on YT during the 1 hour it took me to do this style. I love her styles. 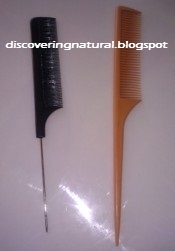 While I was flat twisting my hair, I used a new rat tail comb (see black comb in picture) that I just bought. I noticed that my parts looked more defined than when I used my previous rat tail comb. Nice discovery! This is the first time I have done the vertical flat twists styles. 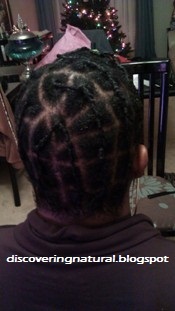 The left side, I did single braids and the designer-twisted my cornrowed ends. So, this morning I decide to apply some oil mixture to my 3 day old style. For some reason, my hair was extra oily and it didn't seem like my hair absorbed the oils. The only new thing I added to my oil mix was grape seed oil. I must have put too much because..all day long it was dripping! LOL. So, I decided to twist out my two strand twist and put my hair in a loose curly puff using a 5 inch banana hair clip. My two strand twist out using a banana clip for the puff area. So, I have had my hair in cornrows for about 18 days now. I was pushing for 21 days but I just wanted to do something different. It was not itching and neither did it looked dry. After taking out the cornrow, I did notice some dry patches. Apply mixture of grape seed oil, almond oil, tree tea oil, coconut oil, vitamin E and jojoba oil. 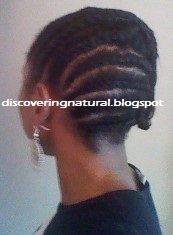 Style with Cantu Shea butter leave in. I had more tangled up hair since my hair has not wash my hair for a while. Normally, I wash every 7-10 days. Not going to push it this long again. =(. You can see my curl pattern coming in. Picture shown is from my front bangs. 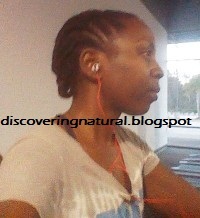 Even though I cornrowed for other people, I have not tried cornrowing my own hair. It is MUCH harder, but totally worth it in protecting my hair. It took about 2 hours to do this style. For some reason, I had to turn my back to the mirror while doing this because I found myself looking at myself and making mistakes and having to repart my hair over and over. Why did I decide to do this style? In order to prevent shedding and breaking of hair while transistioning, I decided to protect my hair with this protective style. It lasted 3 weeks. After the second week, it started looking frizzy, so I did wear my beanie. Working out with 2 week old cornrowed style. Here is a brief explanation about the ingredients I added. You can mix other oils if you want. Mix together, the following until well combined. Last Saturday, I cornrowed my hair and twisted my bangs. I undid my cornrows and 2 strand twists. Here is the outcome. Essential Oils, oh how my hair love you! Pre-transistion, I had not paid much attention to oils and their benefit to my hair. I didn't even read ingredients. Isn't my hair part of my body? Since I read nutritional facts on any food I consume, why do I not do the same for the products I put in my hair. 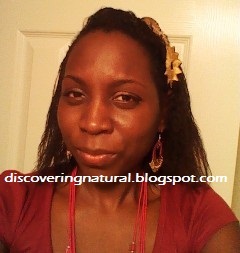 I discovered essential oils and how they can benefit your hair. This website has a list of oils and their benefits. I have used coconut oil (extra-virgin), olive oil (extra-virgin), jojoba, and now, I decided to add grape seed oil and almond oil to my spritz. Since my oldest daughter was 3 months old, I have been learning how to "do hair". 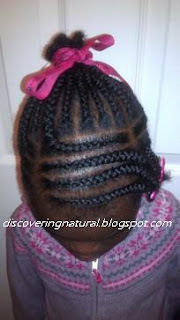 I mostly do cornrows, or what is now known as flat twists. Over the years, I have learnt how to improve my styles. Click here to view some of my designs. I am now 2 months post relaxer. I have been sparingly using Wild Growth Oil. Still need to figure out how to mask the smell. WoooW! Also, I take Biotin vitamins which is good for the skin, as well as the nail and hair. It took me about 30 mins to take off my 11 day old cornrows and apply my pre-poo mix. 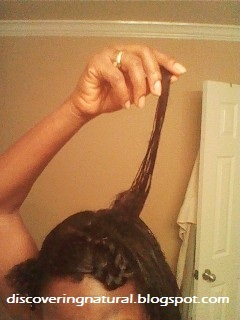 While applying it, it reminded me of when I use to apply relaxer. The only difference was that my scalp was not on FIRE! 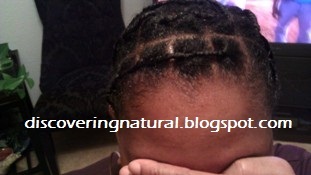 Use EVOO to unbraid the cornrows. Part my bang section with fingers and then gently with comb. Clip with plastic butterfly clip. 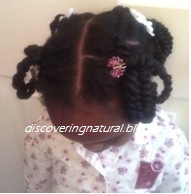 Section rest of hair with fingers and clip with plastic clips. Make a mixture of EVOO, EVCO, Lustrasilk Olive Oil Cholesterol in a small bowl. Start with bang section detangle hair using mixture and then two stand twist that section, clip with bobby pin. The reason why I use pins instead of the clip was because the clip pulled on my hair, and since I will be pre-pooing till this evening when I wash, it will be silly having the clips bulge out of my scarf. Repeat until all section are saturated with the mix. Cover with plastic cap. Tie scarf. Time to shampoo and condition! After several hours of "marinating", I used my CN detangling,conditioner shampoo to wash my hair, still doing so in sections. Note, this is the first time I have ever washed in sections. I then applied my Silk Element luxury condition. I love the way it feels. I covered with plastic cap for 10 mins. I trimmed 1 - 1.5 inches off my hair. Not missing my relaxed hair! Actually, quite happy to see part of it gone; even though it was a small part. Applied Shea moisture Deep Treatment masque. The jury is still out on that one. 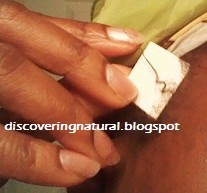 Massage a generous amount of BB growth oil as my hot oil treatment. Cover with plastic cap and wrap head with towel. Wash out the DC conditioner and section hair into two parts. Apply oil mixture (EVOO, EVCO, Jojoba, Vitamin E and BB Growth oil). Then apply Cantu Shea Butter leave in. Finish off with Shea moisture curl Enhancing smoothie. Some key things that I changed. 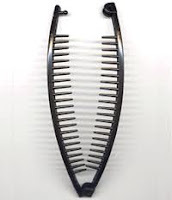 I used my fingers instead of a comb to detangle and "finger-comb" when applying conditioner. I only comb during styling. I did a hot oil treatment in addition to my DC treatement. 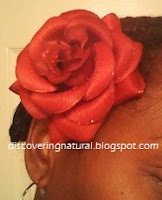 I love making hair accessories. There is just something about them that makes any hair style look even more beautiful. So, I decided to teach my girls how to make them. We got tips from GirlsLoveYourCurls's YT video. You can view all our homemade hair accessories on this page. Click here. My transistion buddy called me this evening to help her figure out what to do to her TWA.. or what we call a "teeny wenny afro". Earlier that afternoon, I sent a couple of hours watching youTube videos. I love GirlsLoveYourCurls. Her videos are so funny and down to earth. After seeing one of the Threading episode, I decided to attempt african threading my friend's TWA. ... and she loved it. 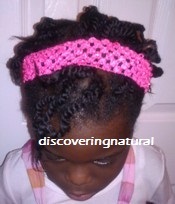 The only time I ever threaded was for my daughter, who had shoulder length (SL) hair. While digging around my old old old pictures tonight, I came across two unique pictures. 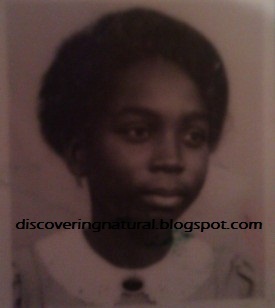 This was the last time I was natural. I was about 13... love the 'fro which was created with tons of pins because I had too much hair. I get the same fullness and length after my transition. Am I becoming a Product Junkie (PJ)?